MS Dhoni’s batting skills may not be as good as it once used to be, one may say. But the same can’t be said about his cricketing brain, which seems to be getting only better. 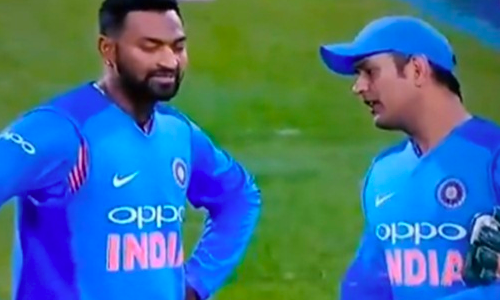 Dhoni, who is known for being the spinners’ captain, was at it once again as he teamed up with all-rounder Krunal Pandya to plot the dismissal of New Zealand opener Colin Munro. With the hosts cruising at 86-1 in eight overs, Dhoni was seen advising Krunal, a left-arm spinner, as to the line and length that he should be bowling. And guess what? Krunal pitched one full outside off as Munro holed it out to Vijay Shankar at long on (see video below). New Zealand, meanwhile, went on to amass 219-6 in 20 overs before restricting India to 139 runs, inflicting the visitors with their worst ever loss in terms of runs. India will look to pull one back and stay afloat in the series when they two teams lock horns in the second T20I in Auckland on Friday.